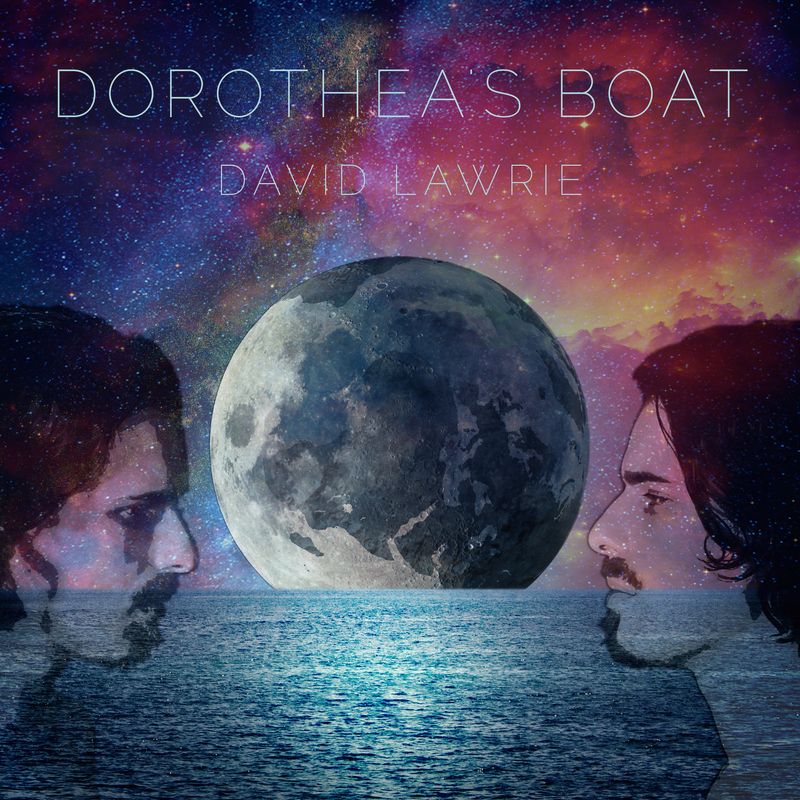 David Lawrie ‘Dorothea’s Boat’ (Ishikawa Records) Released 9th March 2015 – Limited Edition 12” vinyl and Digital download. Hewing a distinctive musical pathway as a chamber pop or Baroque electronica John Donne, the serious and poetically romantic York born troubadour/composer David Lawrie has spent the past few years on releasing his masterful Dorothea’s Boat grand opus. A series of delays and setbacks – mostly outside his control – have stalled previous attempts; the eventual release funded by a Kickstarter campaign last year. Intricately put together like the pieces of a fine Swiss watch, Lawrie’s clockwork mechanical, overlapping layers and nuanced artfully prosed rich songs tend to inhabit their own space outside the confines of easy demarcation; neither wholly contemporary nor reliant on referencing the past, this all-encapsulating cosmic and earthly suffused songbook uses both atavistic instrumentation and electronic devices to build an imaginative world, populated by literature molded peninsulas and a cast of wondrous wild animals. Almost a tragic loss then, Lawrie’s most important work to date has managed a reprieve, saved from total obscurity and the ‘what could have been’ regret of so many shelved or lain dormant projects. Arguably the pinnacle of his recording career, Dorothea’s Boat is pushed out onto the vast and mostly unfathomable seas of exposure in the hope that it will float. A concept album of sorts, in so much as a universal theme of lament, curiosity and love run throughout each vista expansive journey, and the musical leitmotif of course which time and again emerges like a melodic symbol of comfort and hope. Stripped and laid bare, the opening psalm like I Am Megalodon, creates a venerable atmosphere with its triple-tracked vocal harmony arrangement. Named after the prehistoric shark like predator beast of the deep, the allure of a moonlit typographic ocean, lapping on a mysterious shore, Lawrie plaintively yearns for the woman he hasn’t yet met. As the lulling tones dissipate, Lawrie pipes in with an upbeat panoramic African style adventure, opening up a tribal beaten toms chamber pop epic with the album’s signature track Dorothea. A kaleidoscope of Animal collective, Toto, Depeche Mode and Sparks in a neo-Rousseau colourful and childlike jungle of wonder, Lawrie magic’s up a series of expressionistic painted purse stealing baboons, baby sharks (another recurring reference) and tigers. So good is the main thrust, tune and rhythms on this one that Lawrie brings them in again and again throughout the entire album; sometimes almost remixed and other times played by different instruments and woven into new shapes. You can hear it in the following, more ambient, half time steam-electronica of the paean Flourine; in the second half of the safari adventure, Hypochondriacal; and in the glitch-y organic 2-step of the diaphanous pastoral Over, Under. Sounding like leather and wood being recorded stretching over time, the quaintly Baroque plucked introduction of Storm Petrel (the video of which we featured exclusively on the Monolith last year) builds towards a ‘tidal wave’ of stage set thunderous percussion and growling synth, Lawrie strapped to the mast, singing in defiant joy. From there on in, the album seems to follow a slight detour, the previous half following a more congruous lineage, and investigates new vistas; starting with the eastern flavoured (or even Adriatic) cosmological observational deck Species: Lawrie poetically embodying a star formation as he gazes down upon the Earth and astronauts floating about in ignorance of their mission. Following in its wake is the acoustic guitar strummed tetchy sad digital breakdown Gravity And Oxygen and the slithering Panda Bear-esque toms pattered The Serpent And Her Fangs. But the biggest surprise is saved until last as Lawrie strums out on a Pablo Honey era Radiohead meets Green era R.E.M. night flight, Traffic Lights At Night (Yumiko); beatbox percussion over a steaming sustained wash of tablas and indie guitar, Lawrie searches for meaning amongst the fatigue of the humdrum. Sumptuously crafted, creating a magical metaphysical vista, Lawrie composes one of the year’s most colourful – if brooding at times – ambitious pop soundtracks. Not only does it float but sails triumphantly into port on a wave of adulation.